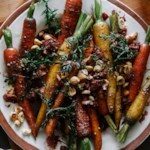 Some cooks recommend sprinkling sugar on top of carrots to glaze them, so that it will marry with the natural juices in the carrots to create the perfect glaze. 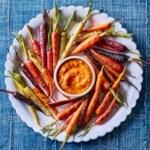 But you can't predict how much liquid will come out of a vegetable, so Chef Naomi Pomeroy developed a more controlled technique in this healthy carrot recipe to yield a deeper and richer flavor. 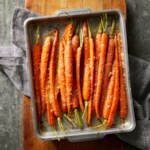 To prepare carrots: Place a large rimmed baking sheet in the oven; preheat to 400°F. Cut off the tip of a carrot at a 45-degree angle. Rotate the carrot a quarter turn and cut off a 1½-inch piece at a 45-degree angle. Continue rotating and cutting along the length of the carrot to create irregular-shaped pieces. Repeat with the remaining carrots. 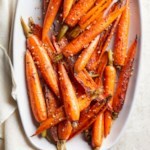 Toss the carrots with oil and ¾ teaspoon salt in a large bowl. 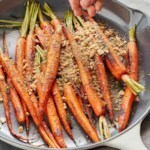 Spread the carrots on the hot baking sheet. Roast, stirring once, until just tender and starting to brown in spots, 35 to 45 minutes. To prepare glaze: Meanwhile, combine vinegar, sugar and salt in a small saucepan. Bring to a simmer over medium heat, stirring to dissolve the sugar. 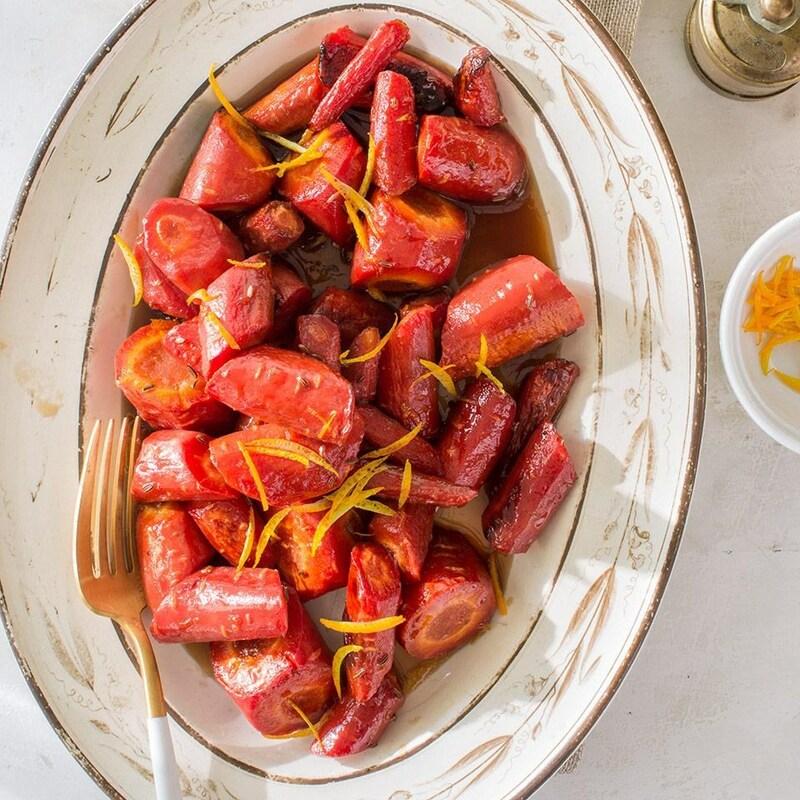 Reduce heat to maintain a gentle simmer and cook, watching carefully to prevent burning, until the glaze is the consistency of maple syrup and the color has darkened, 5 to 10 minutes. Stir in orange zest. Transfer to a small heatproof bowl and keep at room temperature (don't refrigerate, as it will harden). 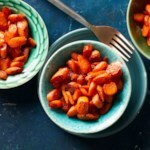 As the glaze cools, it will thicken slightly, but when tossed with the hot carrots, it will return to a syrupy texture. To serve, melt butter in a large skillet over medium-high heat. Add the carrots and caraway seeds and cook, stirring, until the carrots are coated, about 1 minute. Add the glaze and toss to coat, 30 seconds to 1 minute. Serve hot. To make ahead: Prepare glaze (Step 4) and keep at room temperature for up to 2 days.